Should the 2019 Miss Samoa Pageant and Teuila Festival be held in Savaii? Reporter Adel Fruean travelled to Savai’i to cover the pageant and also had the chance to speak to locals on what they thought of Samoa’s two premier events. I agree that those two significant events should be held in Savaii; reason being is that, it has always been Upolu but for this year we had the chance for the first time to host the Miss Samoa Pageant. It was truly a proud historical moment for us all here in Savaii. We are from the big island of Savaii and we are part of Samoa too. I support the idea of both the Miss Samoa and Teuila Festival to be hosted in Savaii. In my own opinion, there should be more promotion about Savaii to the world and if the location changes people will have the opportunity to visit and explore our big island and its natural beauty. Ever since the pageant was held in Savaii people who have never been to Savaii got the chance to come over and see our island. I think that in my own perspective, it should be held here in Savaii next year. Because this very event of hosting the Miss Samoa in Savaii resulted in reuniting the people of this one island, everyone came together to prepare for everything. There should be more important events like this to be held in Savaii, our people in the big island also need to be involved as well in such future events. The next Teuila Festival and Miss Samoa should be hosted here in Savaii. I believe that what is good for Upolu is also good for Savaii; with that being said those two celebrations should have the chance to be celebrated together in Savaii. The majority of important events like Independence are always held in Upolu, we are one people even though we are from different islands but together we make up the Independent state of Samoa. I feel that it is a great idea if those two major events be held in our home island of Savaii. The reason why is because in Savaii, it’s more traditional if it is held here, the involvement of the village councils to uphold Samoan traditions is very influential. It is what makes Savaii so unique is that it is embedded within cultures and traditions. It will help showcase a different view and perspective for once if it is given to our big island to host the following year’s Miss Samoa and Teuila Festival. I think that Savaii is such a beautiful location for the next Miss Samoa and Teuila Festival to be held. But the only problem for this year was the venue where it was held was too small to cater to so many people who all travelled so far as to come witness the first ever Miss Samoa in Savaii. It was quite disappointing for so many to be standing outside and not even get the chance to have a glimpse of what was happening inside. Savaii has so many beautiful natural sites to offer. 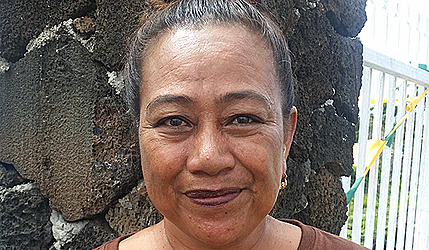 It would be historical to have both events hosted in Savaii. I believe it will serve to make all the people living here in Savaii very happy with so much pride and joy. It is evident with the turnouts in the Miss Samoa Pageant 2018 that many have had to travel from miles around the island just to witness such a historical moment. We also deserve an opportunity to host such events; we are never given the chance to do it. I approve the idea of hosting these two main events in the big island, due to the fact that for us here in the big island we hardly have any major events like these to look forward. For everyone to have the chance to come together and enjoy it, but instead they are all held in Upolu which is quite inconvenient for some to travel all the way there to watch or be a part of. I fully support the Miss Samoa and Teuila Festival to be hosted alongside within Savaii. I am overjoyed as the pageant was held here this year for the first time. I think that Savaii doesn’t always get these opportunities and so it would be quite significant if we would host both for the following year. In my opinion, for me as I am from the island of Upolu, it is such a joyous occasion for the people of Savaii to have hosted the Miss Samoa for first time. I guess it would be beneficial for them but there should be careful planning if it would be held here next year along with the Teuila Festival.